In 1984, club president Tony Ramos announced the formation of an indoor soccer franchise known as the Milwaukee Wave. The Wave have played their home games at various locations, including the Milwaukee Auditorium, the Bradley Center, and the UW-Milwaukee Panther Arena. Although mired near the bottom of the American Indoor Soccer Association ranks for much of the 1980s, the Wave made their first playoff appearance in 1989 and began an impressive run of success under new coach Keith Tozer, beginning in 1992. In the 1993-94 season, Michael King joined the team and quickly became a star, shattering the club record for scoring in a season. He remains the Wave’s all-time leading goal scorer and was a fixture at the club for the following fifteen seasons. In his fifth season with the team, they won their first titles. King’s scoring and the goal keeping of Victor Nogueira propelled Milwaukee to a victory over the St. Louis Ambush in the National Premier Soccer League Championship Series. Nogueira enjoyed one of the finest seasons ever in the NPSL that year, as he was named the 1st team-All League goalkeeper, Regular Season Most Valuable Player, All Star Game MVP, and playoff MVP. The legacy of the mini-dynasty was sealed over the following four years when they returned to the playoff championship series four times, winning one more crown. The team remained dominant in the league and drew hundreds of thousands of fans to their home games. Major Indoor Soccer League (MISL) became increasingly popular in the 1980s, precipitating national television contracts, which happened to coincide with what was perhaps the Wave’s finest ever team. That team reached their peak at the end of the 2004/05 season, when Greg Howes and Todd Dusosky led the team to yet another league title. At the same time that the indoor side was enjoying this golden era, they were attempting to expand their brand to the outdoor scene. After the 2002 season, the Milwaukee Rampage, then of the United Soccer League A-League, announced that it had run out of business and had been purchased by the Milwaukee Wave. Thus, Milwaukee Wave United was launched as the Wave hierarchy sought to preserve an outdoor soccer presence in the city. The outdoor experiment lasted just two seasons in the A-League before they called it quits. 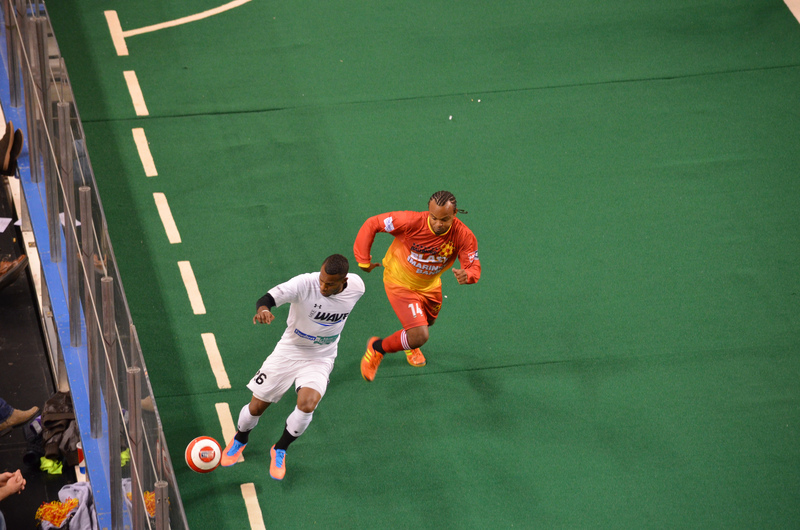 While the outdoor side of things did not work out, the Wave continued to remain a fixture near the top of the MISL standings and won the club’s sixth league title in 2011. They have continued to expand their outreach programs by running summer soccer camps for area youth. ^ Ken Bunch, “New Professional Soccer Team to Be Called Milwaukee Wave,” Milwaukee Sentinel, August 9, 1984. ^ Milwaukee Wave, “A Legendary History and the Dawning of an Unrivaled Era,” last accessed March 19, 2017. ^ Andy Olson, “Very Alive and Kicking”, Milwaukee Sentinel, February 2, 1989. ^ Charles F. Gardner, “End of Road for Rampage”, Milwaukee Journal-Sentinel, January 24, 2003. ^ Charles F. Gardner, “Wave’s Outdoor Venture Grinds to a Halt”, Milwaukee Journal-Sentinel, May 16, 2006. Wangerin, David. Distant Corners: American Soccer’s History of Missed Opportunities and Lost Causes. Philadelphia, PA: Temple University Press, 2011.